The U.S has been in a period of low rates for nearly a decade. As the economy is now approaching full employment and higher inflation, interest rates have been rising from their historic lows. As rates rise, the value of existing fixed-interest bonds falls. What does that mean for the attractiveness of investing in bonds? Should investors be concerned about day-to-day changes in the value in their bond portfolio? This brief explores the difference between the short-term valuation of a bond portfolio compared to the long-term impact of higher rates, and demonstrates how quickly short-term declines are overwhelmed by the effect of higher rates. As interest rates rise, the prices of existing bonds generally decline to the point where their return to maturity equals the new prevailing interest rate. As a general rule of thumb, for every 1% increase in interest rates, a bond or bond fund will fall in value by a percentage equal to its duration1 (The inverse is also true). Generally speaking, longer maturity bonds will have a longer duration and therefore more interest rate sensitivity than bonds with shorter maturities. It can be unnerving to see the value of your bond portfolio falling, and the 3% rates you were happy with a few years ago might not look so great if you could be investing in new bonds now paying 4%. The key is not to think just about an individual bond, but on the positive impacts of reinvesting interest and principal payments at higher rates in new bonds. In the chart below, we show the impact of a 1% increase in interest rates from 3% to 4% (assuming a bond portfolio with a 4.5-year duration and initial value of one million dollars). In less than 5 years after the jump in rates, the higher reinvestment rate has allowed the portfolio to outperform the case of stagnant 3% interest rates. 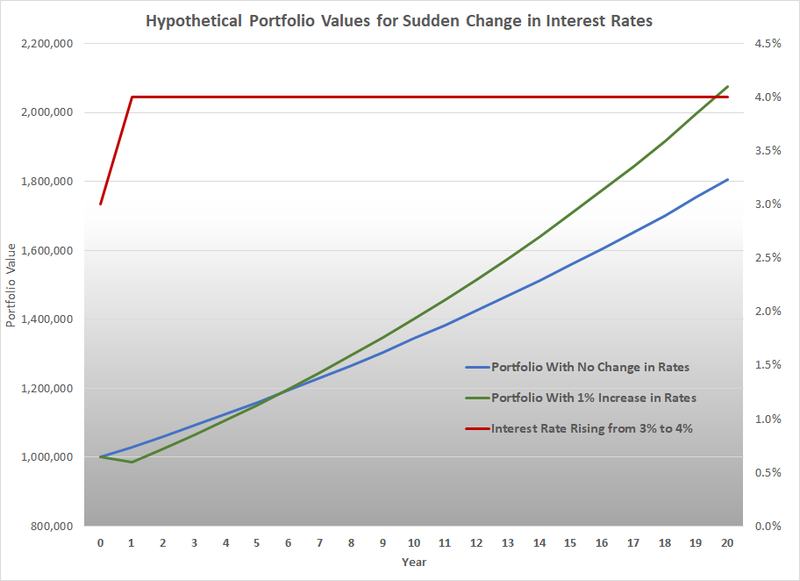 In the chart, a 1% increase in real interest rates seemed to have a negative impact right after it happened (the portfolio with 1% increase in rates is $45,000 less than the portfolio with no change in rates), but ended up actually having a positive impact of $269,135 after a 20-year investment (assuming inflation did not change). For most investors, the threat of rising interest rates are not a reason to sell bonds. In fact, they allow investors to reinvest at higher rates, which is a good thing for investors with a long time horizon. Still, investors should be aware that bond portfolio values could continue to decline in the short term and long-term, rate-sensitive bonds are only appropriate for long-term portfolios. Also, inflation may erode the purchasing power of the income received from bond investments, and rate increases caused by inflation will not help your portfolio. Some investors might ask, why not just sit on the sidelines as rates rise, and then get back in? In a future paper, we’ll explore just how difficult it is to time the interest rate markets, and how quickly you can damage the long-term returns of a portfolio by moving to “cash”. At Plum Street Advisors, we have kept the duration of bonds slightly shorter than our standard benchmark index, and also hold substantial inflation-protecting assets in our portfolios. Recently, the average duration of our client’s bond portfolios has been between 4 and 5 years. As the chart above shows, this means it doesn’t take long for rising rates to be a benefit to portfolios. So the next time you see bond prices fall because of a rise in real interest rates, remember that it’s good news for us long-term investors.